I spent just about four years during and after college working for a small independent new and used record store in the south suburbs of Chicago - Homewood's Record Swap. I still have fond memories of my Days at the Swap. Being a music junkie it was always a thrill to be able to get first crack at the fresh trade-ins before they ended up on the store's shelves. The curled thermal paper faxes that spat out that week's latest releases from import and independent labels were carefully read (unless they ended up falling on the adjacent radiator) to ensure that I didn't miss some rare 7" or limited edition piece from one of the many bands whose music I collected as a "completeist". While we weren't the best overall new or used or indie/import store in the Chicago area, I feel that we were the best to combine all three. Unfortunately the owner, a new father at the time, felt the urge to start carrying a large selection of children's music and toys. Relegated to the back corner of one of the store fronts, all of those stuffed animals and Raffi tapes just collected dust. During my tenure I'm thankful that I made lasting friendships with both co-workers and some of our customers (I'm talking about you, Todd, Chris & Rob). 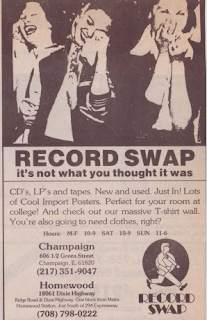 So what got me thinking (and typing) about Record Swap? My mom forwarded along this article about Off The Alley - the all-ages club that Record Swap created. While OTA catered to a slightly younger audience that was into alternative dance music an pop-punk, it still stirred up a bunch of memories from that place. I left the Swap in 1993 to go work for one of the shop's vendors - Feedback, an import and indie label record distributor. Record Swap ended up being one of my accounts. Both the Swap and OTA are long gone, having gone bankrupt in 2000. However, the Swap left an indelible mark on me and my musical tastes. Maybe someday I'll write a post about some of our more interesting customers - the mumblers, Joe Crack, John Everson. Or maybe the extremely frugal owner. That place sucked. Those people were pompous tools. Hope they're bankrupt, homeless and afflicted with AIDS. Hey, thanks for sharing your memories. It was nice to stroll down memory lane. I am sorry that a lame troll left the lamest comment years ago. I think my love of music and L.P.s began here in the mid 90's! Down On The Street - 1947-48 Ford Woodie!